Cool Decorative Light Sign - It lights up and entirely black room. A great decorative light is an addition to any collection. for Home Room, Bedroom, Living Room, Dining Room, Garage, Garden, Porch, Office, Beer, Bar, Game Room, Beach, Windows, Pub, Hotel, Indoors or Outdoors. Birthday Gift, Love Gift, Christmas Gift, Anniversary Gift, Wedding Gift for Lovers, Friends, Girlfriend, Boyfriend, Women, Men, Mom, Dad, Kids, Girls, Boys, Teens, Sisters, Brothers, Grandma, Grandpa, Couple, Parents, her, him, etc. Be A Lovely Lamp Light Night, Eye Catching, Energy Saving, Safe and Low Voltage. Real Glass Handmade, Lightweight and easy to hang up. The item comes with 2-hole plug. Transformer Input Voltage:100-240V, Workable in all countries. We guarantee the safe arrival of the neon signs. If any damage during the shipping, we will resend the replacement parts all at factory cost. Besides, we provide 1 year free quality warranty. 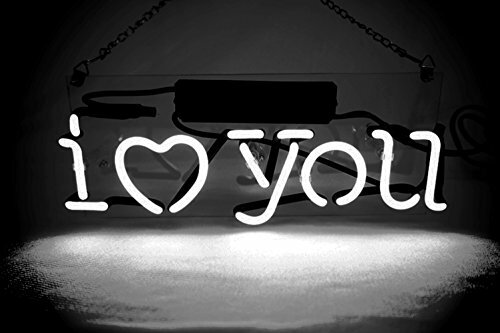 1.Your neon sign mounted on transparent acrylic backplane cut in outline shape. 2.Electronic Transformer (for controlling the electric current) / black cable with plug (Suitable for your local voltage). √ LAMP NIGHT LIGHT - The lamp light is cute and smart with 4-5 years lifetime. the light glow is also warm and give you a nice sleep in the whole night. √ DECORATIVE LIGHTS - Great Decorative Lighting for Bedroom, Living Room, Dining Room, Office, Garage, Garden, Porch, Game Room, Indoors or Outdoors, etc. The neon light sign is an Unique Warm Lamp Light Night, Waterproof and Durable in high temperature.Also, we offer One-Year Free Quality Warranty. If any problem, pls feel free to contact us and we will solve the problem for you within 24 horus. So please Rest Assured to Buy. √ NEON LIGHT SIGN WALL DECOR - Handmde with Real Glass Light Tube, Size is 14" x 8". The wall light fixture is very bright that It lights up and entirely black room. A great decorative light is an addition to any collection. √ FUNNY GIFT IDEA - The neon light sign are great as Birthday Gift, Christmas Gift, Love Gift, Anniversary Gift, Wedding Gift for Women, Men, friends, girlfriend, boyfriend, Mom, Dad, Kids, Girls, Boys, Teens, her, him, Couples, Parents, etc. Imagine So Happy of Them! √ NO BATTERY & ASSEMBLE NEEDED - The small Neon Light Sign is with low energe use while Real glass neon tubes mounted on transparent acrylic backplane cut in outline shape, so No battery and any installation needed. Electronic Transformer (for controlling the electric current) / cable with plug (Suitable for your local voltage). All works are pre-assembled on transparent acrylic backplane with two screws to easily hang it, Just hang them up, Enjoy! If you have any questions about this product by Let's Get Weird, contact us by completing and submitting the form below. If you are looking for a specif part number, please include it with your message.